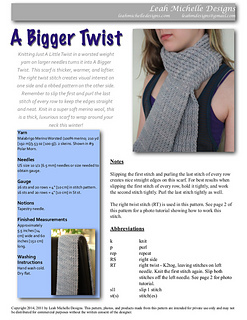 This scarf follows the same pattern as Just a Little Twist but is knit in a worsted weight yarn on bigger needles. It is bigger, thicker, and warmer. The right twist stitch creates visual interest on one side and a ribbed pattern on the other side. 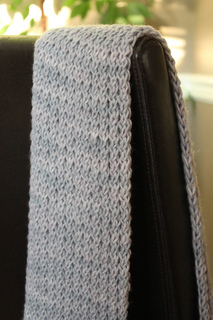 Knit in a super soft merino wool, this is a thick, luxurious scarf to wrap around your neck this winter! Finished measurements: Approximately 5.5 inches (14 cm) wide and 60 inches (152 cm) long. For the DK version of this pattern, see Just A Little Twist.